I am not sure if the phrase “highly anticipated” applies to Prachya Pinkaew’s US debut. First of all, it’s not a phrase I’d use as I have never been fond of his sketchy direction in the first place – frankly speaking, most of his movies are only watchable because of some fine action scenes and outstanding martial arts display; as movies, however, they are generally sub-standard. Secondly, when has the US debut of an Asian director ever been a revelation? Right. Last but not least, when has a US B-movie that is shot more or less entirely in Asia ever been any good? Well. So everything points towards a disaster, not even taking into consideration that Mr. Pinkaew now has to work with real actors, not stuntmen, something like a real script (featuring real English dialogue) and cater to an international audience that expects more than a niche Muay Thai show. 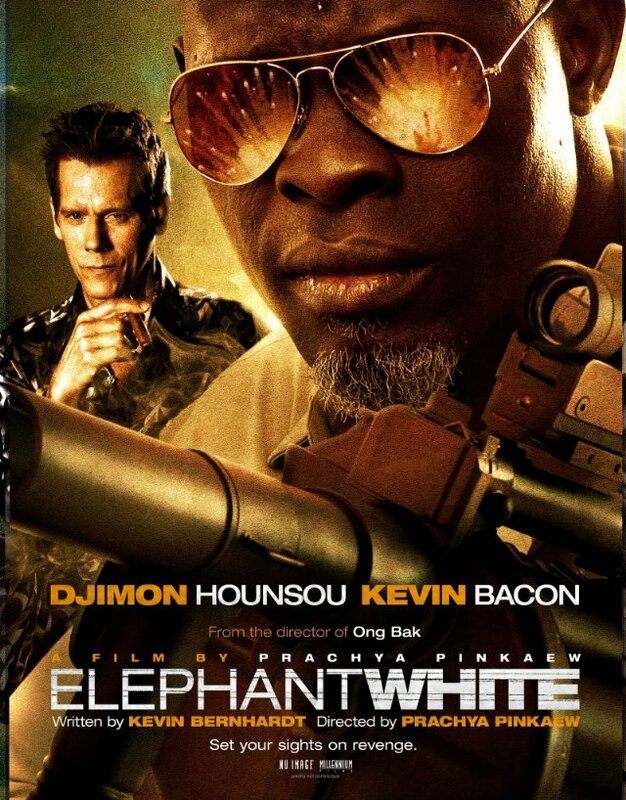 But as positive thinking is a virtue I have tried to look forward to ELEPHANT WHITE, primarily thanks to the unspoken promise of another memorable performance by Kevin Bacon, and possibly Djimon Hounsou. Now how did that all turn out? Let’s begin with the screenplay: ELEPHANT WHITE is a solid action drama (or so it seems at first) about an assassin who is hired by a Thai businessman to avenge the murder of his daughter by slave traders, injecting some initially welcome touch of exoticism and mysticism along with authentic locations and local flair to boost the film’s sweaty atmosphere. As long as all that contributes to the story, place or character development that’s fine with me. Thing is, the script quickly ups the ante and deviates from the actual story, indulging in kitsch and melodrama instead, focusing more on triggering all sorts of emotions than on a believable storyline (even though the final twist is meant to render much of what happens in the movie a “mystery” (which by then however is completely revealed and explained). Add to that a relationship between the main characters that remains largely incomprehensible and is defined through some seriously clumsy dialogue and action scenes that never make sense. The script relies on an intangible past, and it eventually all comes down to Curtie Church in need of weapons and Jimmy The Brit supplying them, for reasons only Mr. Bernhardt knows. While revealing no huge immediately detectable formal issues (other than Mr. Pinkaews previous films, which suggests that the American team has significantly contributed to the film’s hygienic factors and taken Mr. Pinkaews work to a hitherto unknown, albeit not exactly high level) ELEPHANT WHITE however has astonished me with a so far rarely seen repetition of largely identical chapters: again and again Church gets himself new weapons from Jimmy, assassinates the bad guys, works on his “relationship” with Mae, needs more and different weapons, and it all starts all over again. ELEPHANT WHITE is not unentertaining, has some good moments and features some serious shootouts and other action sequences, but what exactly is its point? I’ve been digging a lot, but there is simply no story here, unless you count Church’s relationship with Mae and its implications as a somewhat relevant “love story”. Apart from that we see an unfortunately disappointing performance from Mr. Bacon, who is speaking with a very fake and very exerted English accent while otherwise giving me the impression of being mentally absent throughout his scenes; a key idea and surprise ending that is by far less clever than it thinks it is; and a revenge plot that is thin as paper, or better, is nothing but an initial reason to send Church on his spiritual journey. All things considered, ELEPHANT WHITE is basically a half-assed blend of ANGEL HEART, BANGKOK DANGEROUS, Hong Kong Action flicks and Thai martial arts. I am not sure what the mission was really, but it is safe to say it wasn’t accomplished. Also, Mr. Pinkaew doesn’t do his country a favor by replicating the same old clichés any foreign director would have gone for as far as Thailand is concerned, while on the other hand never developing a signature style or having any noticeable impact on the story or its visualization. ELEPHANT WHITE is a mediocre action drama that could have been better but most certainly never ever really good no matter what – not with this sort of script, director and acting. When the dust has settled all that remains is a B-movie that will have a very hard time to find an audience. This entry was posted on 2011/03/30 at 00:05 and is filed under TITLE E, US YEAR OF PRODUCTION 2011. You can follow any responses to this entry through the RSS 2.0 feed. You can leave a response, or trackback from your own site.